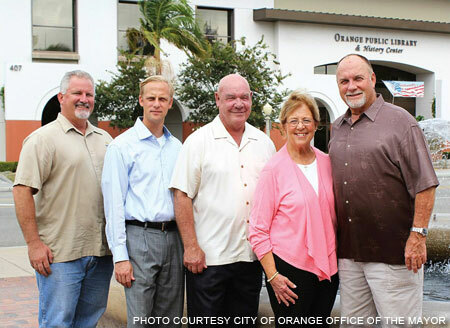 MAYOR TERESA SMITH, of the City of Orange, California, is one of the Orange, California, Lodge's biggest fans. "This lodge has been a major community contributor for over fifty years," says Smith. "Many programs that we enjoy would not be possible without the continued support of the Orange Elks. If there is a need, from donations of money, scholarships, labor, or expertise, this lodge will find a way to make it happen." Of course, Smith is biased-her husband and son are both Elks, as are several other members of her family. But whatever their bias, no one can deny the effect the Orange Lodge has had on its community by helping the poor and downtrodden, honoring and supporting veterans for their service, and giving solid leadership to young people. By always being ready to help out, whatever the cause, the lodge's members have become Orange County's knights in shining armor. 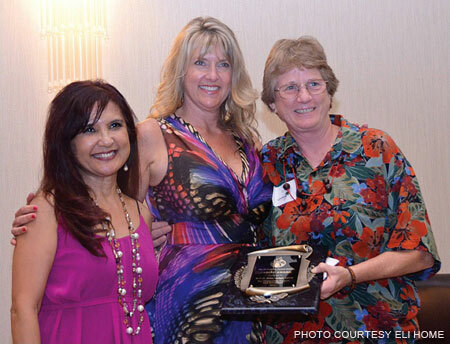 Teresa Smith, the City of Orange's mayor, is a big fan of the Orange Elks. A number of her family members, including her son, her husband, and two brothers-in-law, are all members of the Orange Lodge. Pictured with Mayor Smith are (from left) her brother-in-law Mark Bright, her son Patrick, her brother-in-law Dean Smith, and her husband, William. 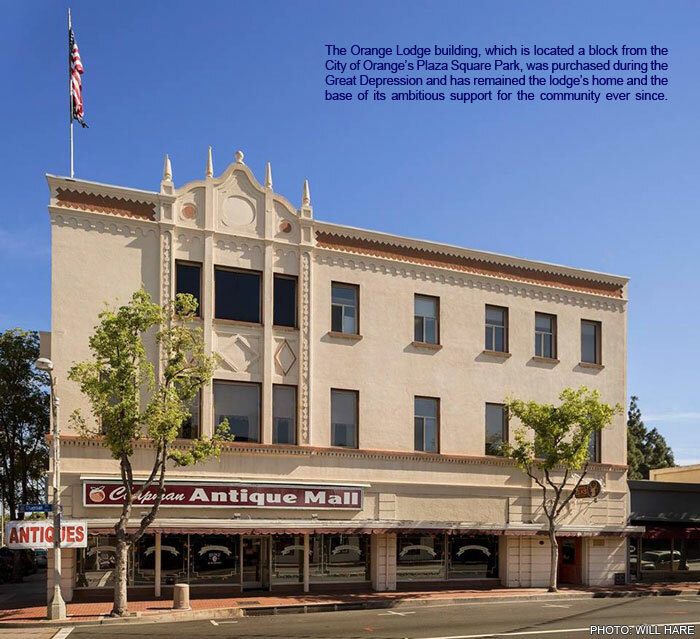 The Orange Lodge was established in 1923 by members of the Santa Ana Lodge. The new lodge quickly grew despite adversity. While the lodge was still in its early years, the nation entered the Great Depression, but the difficult times also provided opportunity. Thanks to a crash in property prices, the lodge's members were able to purchase their building, and they have remained in their beautiful downtown location ever since. The lodge grew from World War II until the 1960s, reaching a total membership of more than eight hundred members. In the 1990s, however, membership numbers started to dwindle, reaching a low of 568 in 1999. But then things started to look up. The lodge inducted its fi rst four female members in 1999 and also made several business arrangements to improve its financial health; since then, thanks to the enthusiasm of its members and the leadership of a series of energetic exalted rulers, the lodge's membership has far surpassed its 1960s peak. Today, the lodge boasts 1,318 members; its membership has the youngest average age of any lodge in the California Orange Coast District, and the lodge also has the highest percentage of female members in the district. With this growth and energy has come national recognition , with the lodge being named the All-American Lodge for Division Five at the 2015 Grand Lodge Session in Indianapolis. The lodge also earned five-star awards for its performance in the ENF Chairman's Challenge and for the design of its website. This recognition is the product of the lodge's many noteworthy accomplishments in the service of the community, and while the lodge's members are justifiably proud of their awards, their first priority is to work in their community to help those in need. Over the years, the lodge has developed partnerships with a number of like-minded charities that support the outcast, the destitute, and others who are truly in need of help. One such place is the Eli Home, which is in essence a safe haven. It is a place where no one is judged and where sanctuary and shelter are offered to abused and neglected children and their mothers 365 days a year. The Eli Home not only provides a safe place for these families but also strives to change their lives and break the cycle of abuse. Pictured are (from left) Eli Home Executive Director Lorri Galloway and Program Director Kim Tulleners presenting a plaque to Orange Lodge Eli Home Committee Chairman Terrie Schatz to thank the Elks for the great support they have provided to the mothers and children at the home. The home runs three shelters, provides counseling offices and services, operates a 12,000-square-foot thrift store, and coordinates a mentorship program. The Orange Elks volunteer with the home, mentor its clients, and make donations to the home throughout the year, but what they give on one particular holiday changes hearts and gives hope like nothing else. Eli Home Cofounder and Executive Director Lorri Galloway fights tears as she speaks about the impact of the Thanksgiving feast the Elks provide each year. "One doesn't usually think of Thanksgiving as a holiday where giving is so important. Yet, it is a holiday of tradition, home, and faith, and the Elks truly make it special." All Eli Home residents are invited to the lodge on Thanksgiving for a home-cooked Thanksgiving dinner. Elks volunteer in the kitchen, cooking dozens of turkeys and making side dishes according to secret family recipes. After a scrumptious sit-down dinner is served, the lodge becomes the site of a carnival. Dazzling magicians, face painters, furry therapy dogs, and a host of games await the children in attendance. Before the event ends, the mothers receive gift cards to department and grocery stores, and the children receive Thanksgiving presents. "You can't believe the tears. These are mothers and children who thought that they were forgotten," Galloway says. She smiles as she recalls the tremendous outpouring of gratitude from these families. "They are already overjoyed at the gift of a real Thanksgiving meal, but to add the carnival and gifts is just an overwhelmingly emotional moment." The Orange Elks also adopt the children at the Eli Home for Christmas. They gather wish lists and check them twice to give each child a warm and wonderful holiday. The mothers are also provided with generous, well-stocked Christmas baskets. The need for food in the community, however, isn't only felt during the holidays. With yearlong financial and volunteer assistance from the Orange Lodge, Mary's Kitchen is able to extend help to needy members of the community throughout the rest of the year. The kitchen's volunteers serve one hundred people a day, a rate that has seen a significant increase in the last few years. 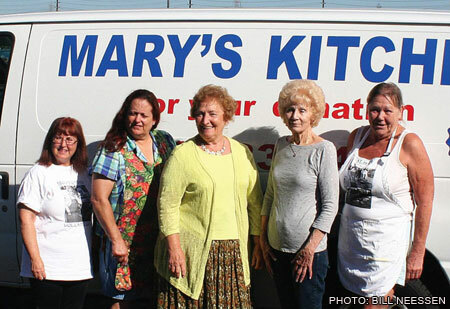 Pictured in front of the Mary's Kitchen van with Mary's Kitchen President Gloria Suess (center, in yellow dress) are four Orange Lodge members who volunteer to help serve needy community members at the kitchen every Monday. They are (from left) Janet Gugino, Sue Siegel, Norma Rapp. and Sandra Wallace. The Orange Elks provide a special Thanksgiving dinner for the patrons of Mary's Kitchen, too. The meal features deep-fried turkeys, and donations from the lodge help the organization provide those in attendance with hot showers, basic toiletries, and clean clothing. Gloria Suess of Mary's Kitchen gushes with enthusiasm about the Orange Elks. "They not only volunteer each week to help with meals, they send clothing and food, and when something breaks, I know I just have to call and a lodge member will be here to fix it. Plus, they are the best I've ever seen at getting the word out about our kitchen. When food or clothing falls short, we tell the Elks, and the next thing you know we are in the paper or on the local news and the donations pour in. They are simply the best." The Orange Elks are committed to fulfilling the Order's pledge to veterans that the Elks will "never forget them" and support several local programs that assist veterans in need. One significant example is the Broadway Manor House in the nearby city of Santa Ana. The house, which operates under the umbrella of Orange County Veterans First, is supervised by veteran Martin Ventress and is a place where veterans who need shelter or a place to transition to civilian life can stay free of charge. Services are available to help veterans deal with alcohol and drug addiction. The house offers on-site counseling and assistance developing a resume and finding a job, and resident veterans also have access to medical, dental, and legal services. A similar home for female veterans is scheduled to open in the near future. 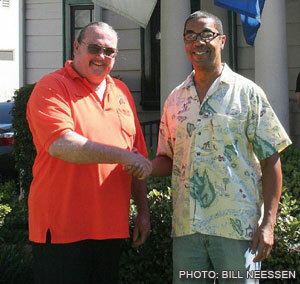 Pictured outside the Broadway Manor House, which is a transitional residence for homeless veterans, are (from left) Orange Lodge Veterans ServIce Committee member Thomas Ruff and Broadway Manor House Manager Martin Ventress. The house is a six-bedroom home that holds twenty-one beds, and there is a long waiting list to get in. With a $2,000 Elks National Veterans Service Commission Freedom Grant, the Orange Lodge helped provide the home with new carpeting, paint, beds, and supplies, as well as the labor to make all these renovations a reality. The Orange Elks help out at Manor House in other ways as well. While the house has an on-site cook five days a week, the resident veterans are on their own on the weekends-or they would be, if the Elks didn't send over food from the lodge kitchen on three or four weekend days a month. The Elks also provide holiday meals, gift baskets, and monetary donations to the home and the veterans staying there. 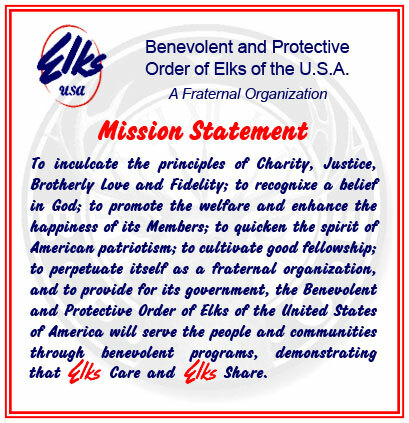 "We deeply appreciate and have so much gratitude for the Elks and all of their help on so many levels. We never take them for granted," says Ventress. He adds, "I would also like for the Elks and everyone else to know that as much as you appreciate our service, we appreciate you, your help, your prayers, and we thank you so much for continuing to support us." Another veteran-related activity in which the Elks have become involved is the Patriotic Service Dog Foundation, which was founded by Vietnam War veteran Tom Tackett to help combat veteran suicide. 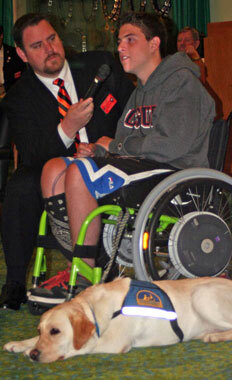 Tackett, who is the owner of Tackett's Therapy Dogs, had worked closely with the Orange Elks before. 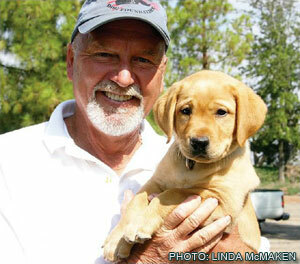 Donations from the Elks over the years have enabled Tackett to purchase dogs, acquire equipment, hire trainers, and expand his programs. So when he decided to start the Patriotic Service Dog Foundation, he knew right where to look for assistance, and the Orange Elks came through with more than $3,000 in donations. Vietnam War veteran Tom Tackert founded the Patriotic Service Dog Foundation with the help of a generous donation from the Orange Lodge and provides service dogs to veterans who have post-traumatic stress disorder or traumatic brain injuries. The Patriotic Service Dog Foundation's motto is Twenty-two to Zero, which refers to the Veterans Administration's estimate twenty-two US veterans commit suicide every day. The post-traumatic stress disorder and traumatic brain injuries that many veterans have as a result of their service can often be helped by the comfort provided by the gentle spirit of the therapy dogs that the Patriotic Service Dog Foundation trains. "Besides money," says Tackett, "the Elks offer volunteers to help us with the dogs, and the best part is that they get the word out about what we are doing here. Their impact in media attention is staggering and has resulted in donations of dogs, money, and amazing community support." The Orange Elks are also committed to providing for their community's future by supporting young people, by brightening the lives of children with special needs, and by encouraging future leaders to develop their skills. One notable activity the lodge has undertaken involves a partnership with the Down Syndrome Association of Orange County to hold a carnival and day of fishing for the families the association serves. To serve the more than two hundred families that attended, the Elks reserved a catch pond, secured the donation of plenty of rods and reels, and stocked the pond to ensure a perfect catch . After landing a fish, each child was awarded a medallion and had the option of continuing to fish or taking a ride on a pontoon boat across the lake. 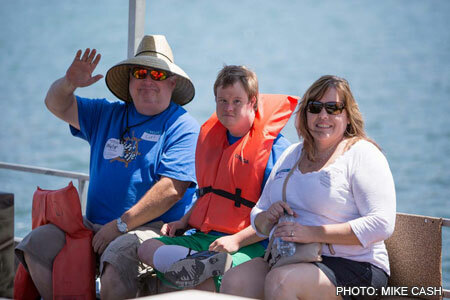 Down Syndrome Association of Orange County Executive Director Kellie Perez attended the Orange Elks' fishing day and boat trip, shown along with DSAOC members Curt Dominguez (left), and his son Chad Dominguez (center). Nearly fifty Elks cooked hot dogs and hamburgers and provided an all-American summer picnic and a good old-fashioned carnival that featured games, magicians, bounce houses, police with their police dogs, firefighters with their fire engines, and Elroy the Elk. Kellie Perez, who is executive director of the Down Syndrome Association of Orange County and the mother of one of the attending children, was utterly stunned by the program. "As a parent, I was overjoyed with the laughter, the planning, that no child was left out, and that the Elks just accepted these children like any other kids." As always, the Elks have reacted to their own success by raising the bar and are planning an even bigger event for 2016. 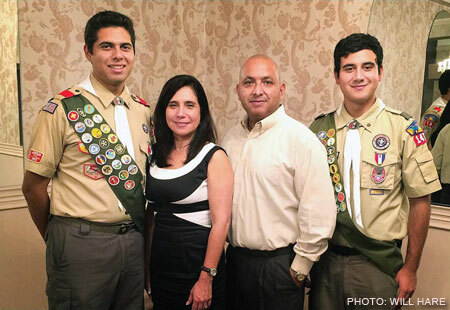 A total of eleven scouts from Boy Scout Troop 1475, which is sponsored by the Orange Lodge, have earned the rank of Eagle Scout, including brothers Brian (pictured at left) and Jonathan (right) Delgado. They are pictured here with their parents, Kelly and Gonzalo. The lodge's commitment to youth shows in a wide variety of other activities as well. The lodge sponsors Boy Scout Troop 1475 and Girl Scout Troop 1475, and lodge members have volunteered as troop leaders. When requested, the lodge has also assisted the scouts with their Eagle Scout and Gold Award Projects. Beyond scouting, the lodge provides scholarships to high school graduates, organizes drug awareness programs at local schools, and distributes dictionaries to third-grade students. And when local school districts have a need, it is often met by a lodge donation that provides computers, coloring books, or school supplies. ZACK COLLIE was an ordinary high school student when a devastating accident changed his life forever. After a dive into shallow ocean water, he was paralyzed and spent nearly three months in the hospital--and his reoovery didn't end there. His injuries will require therapy for the rest of his life. In the aftermath of Collie's accident, his family's home needed to be remodeled to accommodate his wheelchair, and the family was also faced with the expense of purchasing a handicapped-accessible vehicle. Insurance covered only some of these costs; in many cases claims were denied, but when the Collie family looked to the Orange Elks for assistance, the lodge came through for them in a big way and continues to help. Orange Lodge members have volunteered their time to help the Collie family, and the lodge continues to hold numerous fund-raisers and donate money to help provide for Collie's continued care. Pictured during the 2013 Elks Youth Appreciation Night are then-ER Colin Smith, Zack Collie, and Zack's service dog, Sedona. These are only a few of the dozens of community efforts the Orange Lodge supports. Lodge donations and lodge members' efforts also go to help charities and community organizations that encourage education and artistic expression for young people, to assist the local police department's K-9 program, and to support children and families with serious medical conditions. And the lodge's own Hoop Shoot and Americanism programs provide avenues for young people to compete with one another, learn self-confidence, and come to know the Elks as people who care, share, and have fun while doing it. 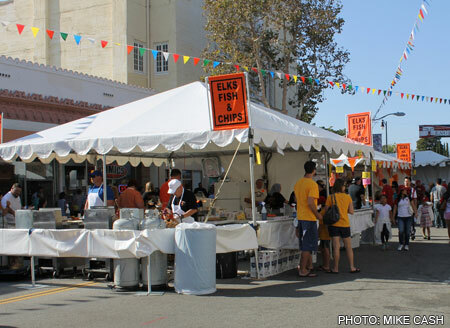 During the Orange International Street Fair, the street outside the Orange Lodge is transformed into a litlle piece of England, where visitors can stop to enjoy some fish and chips. The flip side of all of this benevolence is a committed and creative dedication to fund-raising. Lodge members work all year to ensure that they will have the resources they need to help a community that has come to rely on them. One such sou ree of funding is the annual Orange International Street Fair.The flip side of all of this benevolence is a committed and creative dedication to fund-raising. Lodge members work all year to ensure that they will have the resources they need to help a community that has come to rely on them. One such sou ree of funding is the annual Orange International Street Fair. 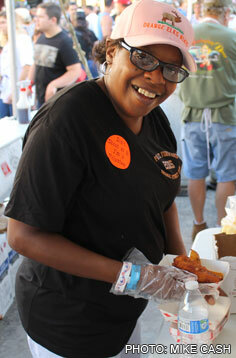 Orange Lodge Esquire Roslyn Peggins prepares an order of fish and chips for a customer at the lodge's booth during the Orange International Street Fair. The fair is by far the lodge's biggest fund-raiser. Held every Labor Day weekend since 1973, this community event draws nearly five hundred thousand visitors a year to a downtown that has been transformed into a global village. In keeping with the international character of the fair, the Orange Lodge's booth offers a taste of England, with food and beverages inspired by that country's traditional snacks, such as fish and chips. The lodge also sets up a stage and features the talents of local musicians. Several of the community programs the lodge assists during the year use this as an opportunity to give back to the lodge by volunteering to pitch in and help-although Tackett's service dogs tend to steal the show. The rest of the year, lodge members continue to work hard and play hard, raising funds through such events as dart tournaments, casino nights, and raffles for unique prizes, including a replica WW II military police bicycle. The lodge's ENF Committee takes full advantage of the grants available through the ENF Community Investments Program, and all of the lodge's members are diligent in securing donations of money, services, and materials. This has helped the Orange Lodge support more than twenty-seven community charities. Each year, this lodge's members set the bar for their own achievements higher and higher, and each year, they succeed in reaching it. In continuing to outdo themselves, they have improved the lives of thousands of their fellow Americans. It's no wonder that the Orange Lodge has earned the title All-American Lodge.